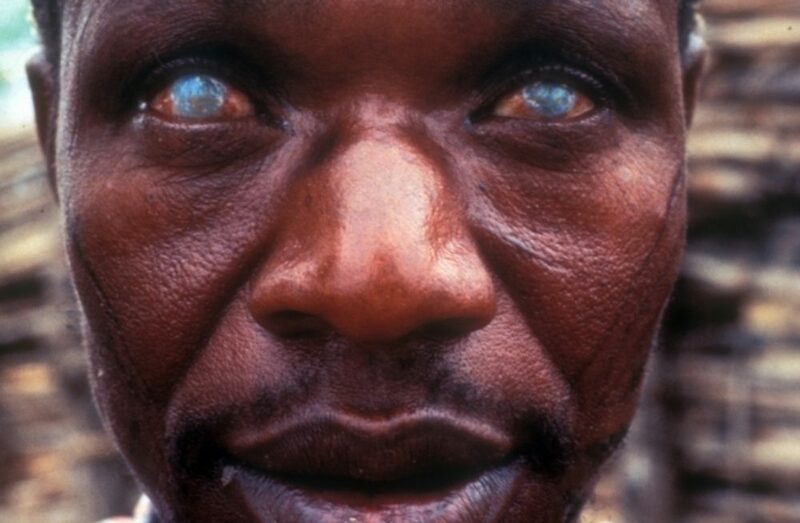 Onchocerciasis, or river blindness, is a parasitic eye and skin disease. It is caused by a worm (filaria) and is transmitted to humans through a type of biting blackfly. These flies breed in fast-flowing streams and rivers within intertropical zones, increasing the risk of blindness to individuals living nearby. Once in the body, female adult worms release up to 1000 eggs per day. These move through the body, and when they die they become very toxic to the skin and eyes. The symptoms of onchocerciasis include skin rashes, lesions, intense itching and skin depigmentation. River blindness is the world’s second leading infectious cause of blindness. The worms can be found in all internal tissues of the eye – except the lens – where they cause eye inflammation, bleeding and other complications. After repeated years of exposure, these lesions may lead to irreversible blindness and disfigurative skin diseases that are often called “leopard” skin or “lizard” skin. About 90% of the disease occurs in Africa. In some communities, about 50% of men over the age of 40 have been blinded by the disease. People often flee the fertile river valleys to settle in safer, less productive upland country.